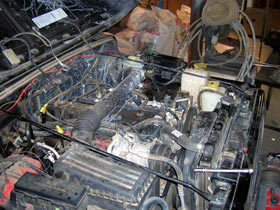 "Nothing new about an intake kit. Ah, heck they don't really do anything but make your vehicle louder and there is not much that an intake kit can really do now, is there? I won't believe it until I see it on a dyno!" Yeah, I've heard these comments before, too, and to be honest, I have not necessarily bought into the hype, either. 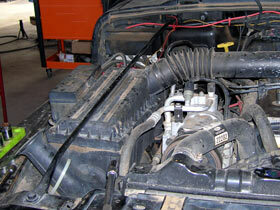 I have done a lot of other things to my Jeep but left the stock intake box and tube in the vehicle. Shortly after moving to Colorado, I went out wheeling with some friends from a local club and laid my vehicle over. While getting it back together I decided that it was time to make a few more modifications and a give it a real tune up. 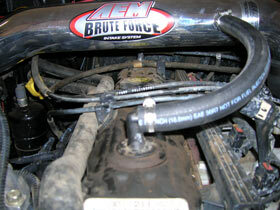 When I was ordering parts, TXJEEPER (our Editor) suggested that I try out the new AEM Brute Force Intake system. I agreed to try it and soon we had one winging its way toward my garage. 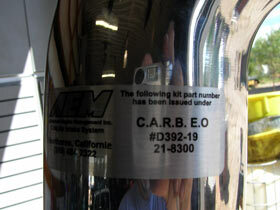 The AEM intake comes in both polished or aluminum versions. Mike, of course, sent me the polished version, as he knows my aversion to bling. But barring something bad happening to my boss due to this lack of taste, it does make the engine bay look cleaner and I can always use it as a mirror on those early mornings when I have to shave in camp before hitting the trail. C.A.R.B. approval - Yes, it's LEGAL! *Note: Upon original receipt of the kit, it had a standard oil-impregnated gauze filter. 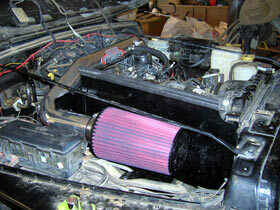 Prior to our dyno testing we replaced the gauze filter with AEM's new DRYFLOW Synthetic Air Filter. These filters are available as a replacement part for earlier intake systems and require no oil. 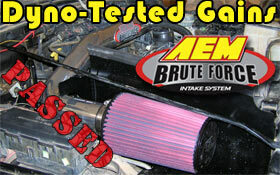 AEM currently ships the DRYFLOW filter with it's Brute Force Kits. Having and using the oil-free filter is terrific. With no real way to test it, I only have to believe that the manufacturer's claims for filtration are accurate since I don't want dirt in my engine. But I can say without a doubt that the new oil-free filter is far easier to clean and replace than any of the oiled filters I have used. For more details from the manufacturer check their webpage here: AEM’s Revolutionary DRYFLOW Synthetic Performance Air Filter—Better Filtration & Dust Trapping, No More Oiling! Image of a DRYFLOW Synthetic Filter. In the pictures of this article the red filter is the original and the grey filter is the DRYFLOW. Once the kit arrived I opened the boxes and got to work right away. Now before I go into the very simple install I do want to point out a few things that may be different from my install and my eventual results. 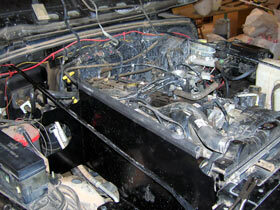 The TJ I am working on is highly modified, or at least reasonably modified. Prior to the install, I ran a stock replacement K&N Filter in the factory air box, and I have a modified throttle body and already run a throttle body spacer. This configuration has worked quite well at turning 37 inch IROKs with 4.56 gears through my 3 speed automatic transmission. The rig runs very nicely down the highway (albeit at a little higher RPM then I would prefer). I also have an aftermarket coil setup with thick, low resistance, high strength wires and spark plugs with an incredible gap (due to coil output). 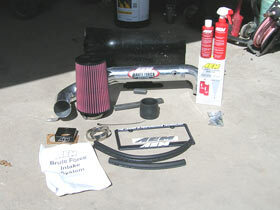 The first step in installing the AEM kit is to remove the stock components. 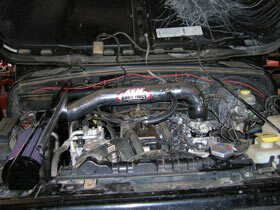 The first thing to remove is the stock air box and tube. If you need specific instructions you can refer to the AEM instructions as they walk you through each step with pictures and directions. 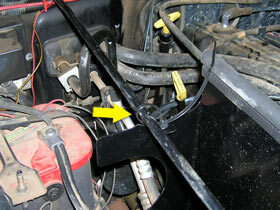 Here you can see the stock layout of the air box and tube. Note the horn on the front of the box. This is where your stock engine breathes in its air. 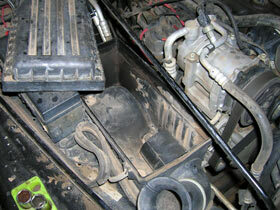 My engine is usually pretty clean, but even so, you can see the dirt accumulated inside my airbox.. 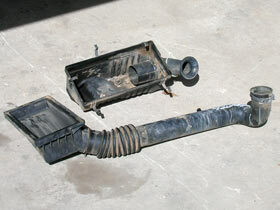 Here is the box and tube removed from the vehicle. Once the airbox is removed from the vehicle, the next step is to remove the four bolts which hold the throttle body to the manifold. Yuck! My throttle body needs cleaning. Now is a good time to clean yours, as well. 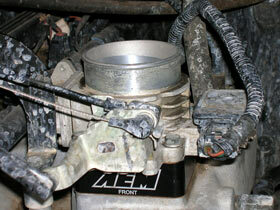 Now just reverse what you have done and install the AEM throttle body spacer with the new gasket supplied. 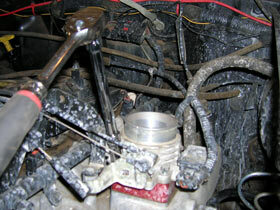 Even if your old gasket looks good, don't use it. Use the ones that came with the kit. Bolt the new spacer down underneath the throttle body with the longer bolts supplied and then install the rest of the hardware to make your linkage work with the new spacer (I didn't need to do this on mine since I was simply swapping one spacer for another). 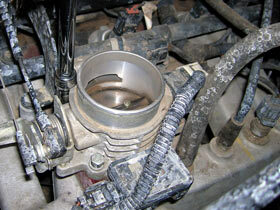 Longer bolts drop through the throttle body. Be careful not to drop anything down into the manifold. Once you have everything tightened up, check the linkage for binding and you should be good to go. Now move on to the installation of the heat shield. Again, this is a simple operation and should take only a few minutes to accomplish. The instructions are good but here are the things to look for. This is where the heat shield goes. Notice the padding on the top of the shield. It is to protect and seal against the hood. At the front of the heat shield it will tie into the upper radiator bolt. You will need a deep socket to reach this bolt. 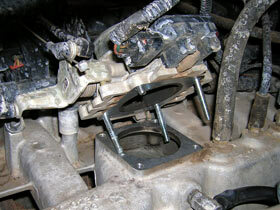 This rubber mount is included with the kit and allows the system to move, yet be solidly mounted. 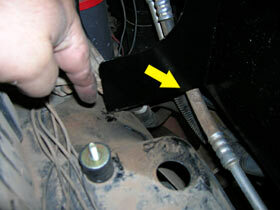 Here you see the rubber mount and the bolt that each go through the fender to secure the shield. Make sure you have plenty of clearance between your a/c hoses and the shield, as the shield will move and you want to make sure you won't cut a hose. 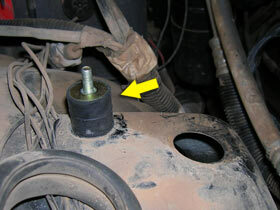 AEM even supplies a wire tie to secure the top of the shield to the radiator mount strut. I had to mount mine on the opposite side compared to the AEM instructions. Once the heat shield is in place it's time to move on to installing the air inlet pipe and the filter, followed by the new piece of hose to connect the intake to the valve cover breather. 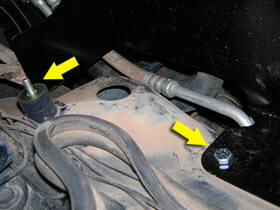 Connect the supplied hose from the air inlet pipe to the breather. 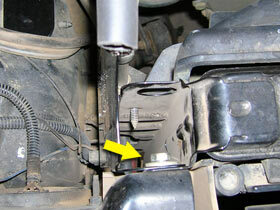 Installation is a snap and should take less than an hour to complete. Now drive around and have fun with your new-found power. Oh wait, you are a skeptic and don't believe me when I say this is well worth the money. You want proof, right? Fine. Turn the page and let's make you a believer.